Me–the expert procrastinator–decided to participate in Kristi’s Make It Happen! Monday, at Addicted2Decorating, whereby she, and anybody else who dares to take it on, commits to finish one of those ‘hanging-around-never-done’ projects in a week. Actually finishing a project when I said I would — what a wonderful feeling for a procrastinator, eh? 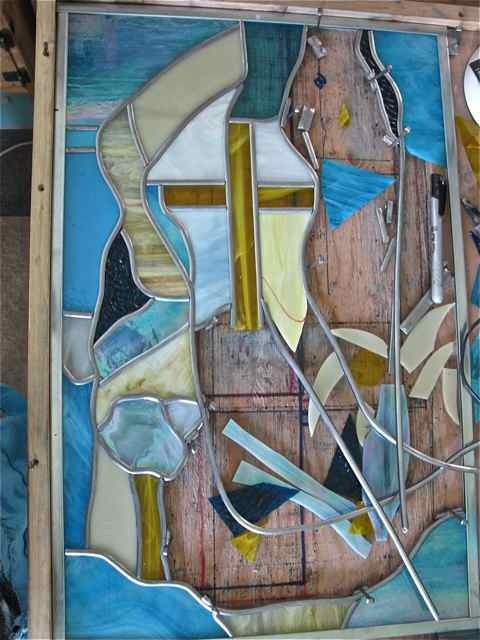 Feeling full of vim & vigour with this first success, I quite ambitiously comitted to finishing my current stained glass commission [due in July] — at least the glass cutting & leading work. 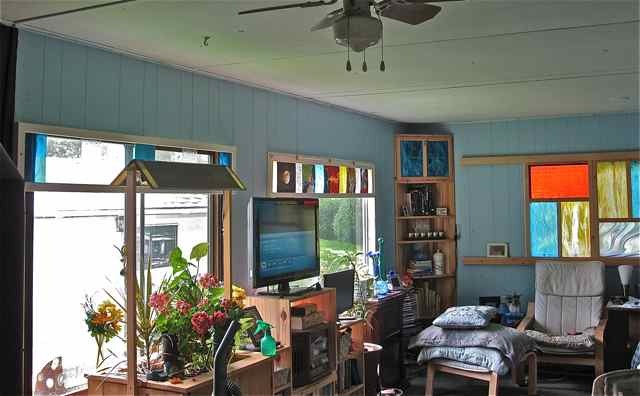 Hmm, yeah, a simple paint job takes quite a few hours less than fitting glass into an abstract puzzle. Besides not getting right into it, I did some work on a new project — yup, a procrastinator’s diversion. 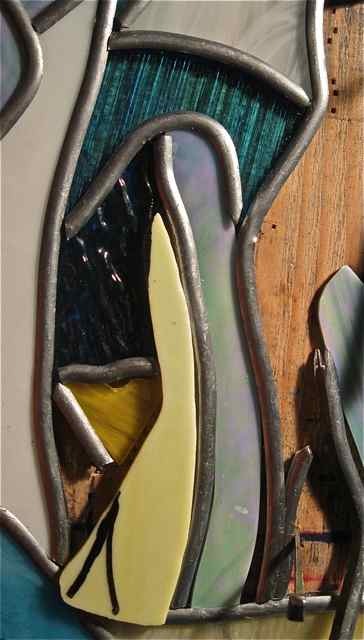 Spaces between stained glass pieces holds photos that can be easily changed. The valances continue the glass colurs from the shutters on back wall but the frames were painted ivory to match the window trim. Straight cuts are easy — the more difficult pieces around the flowers were more time-consuming than I thought they’d be — especially the section with the bluebells [right]. That blue piece — like an upside down horseshoe was not easy with it’s deep curve. And I’ve a few weirder shapes coming up! So, for this week, my commitment [AGAIN!] to Make It Happen Monday is to fully complete the commission work, Flower Power. Additionally, I commit to finishing the valance project by picking four photos [only 4 will be hard], printing them, & slipping them into place [so easy]. Yes, again I just barely got this post done on MONDAY! Talk about procrastination, eh? Check back next Monday [June 25th] to see how I do at Making It Happen.